Cinnamon Churro flavor comes with a great aroma and taste of its own. Whenever you’re craving for cinnamon taste, this is your go-to answer. 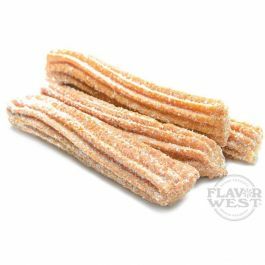 Type: Cinnamon Churro Water Soluble Flavoring. Ingredients: Natural and Artificial Flavoring, Propylene Glycol. USP Kosher Grade Flavoring. Usage Rate: 15-20% for E-use. Flavor suitability: beverages, chocolates, drinks, vegetables, fruits and chocolate desserts, caramel, bakery recipe and more. Specific Gravity: 1.09 No Refunds on Flavoring. great idea needs some work. When I first saw this I was super excited, I ordered it and made a batch of it when it first came. I was disappointed, the cinnamon is the candy type one you would find in a red hot and not in a dessert, it really overpowers what ever is in the mix to make it taste like a cinnamon churro, I can only vape on it for a short time before it begins to bother my tongue and pallet, which is not what i wanted, I will probably not ever use this flavor again. I spent some time in a vapor shop trying to make the right churro flavor and we got close but not close enough that's why I wanted to try this flavor. I really hope Flavor West can find a good formula for this flavor because it would be amazing to say the least. Please let me know if and when you re formulate this flavor I will order it as soon as you do. Thank you in advanced Greg.